This entry was posted on March 5, 2018 by Ryan Van Hoozer. If you've ever struggled with steering on your boat because of a stiff and unresponsive steering cable, then you probably know how important having reliable, well-maintained steering components is. Regular maintenance of your steering system will avoid the pains of difficult steering, and while replacing a boat steering cable can be challenging, it's a repair that is totally doable for the mechanically-inclined boat owner. Most recreational boats use either a hydraulic steering system or a mechanical steering system. In this article, we will be focusing strictly on mechanical steering; if you would like more info about hydraulic steering maintenance and repair, just give Marine Parts Source a call at 866-388-0390. Regular inspection of your mechanical steering system is crucial to avoid headaches when you are out on the water. Inspecting the steering components two or three times per year is sufficient to make certain your steering system is in good working condition. Because the steering components are heavily-used moving parts, regular wear and tear are common, and you'll want to check hardware at both the steering helm and the engine ends for wear, corrosion, rust and so on. 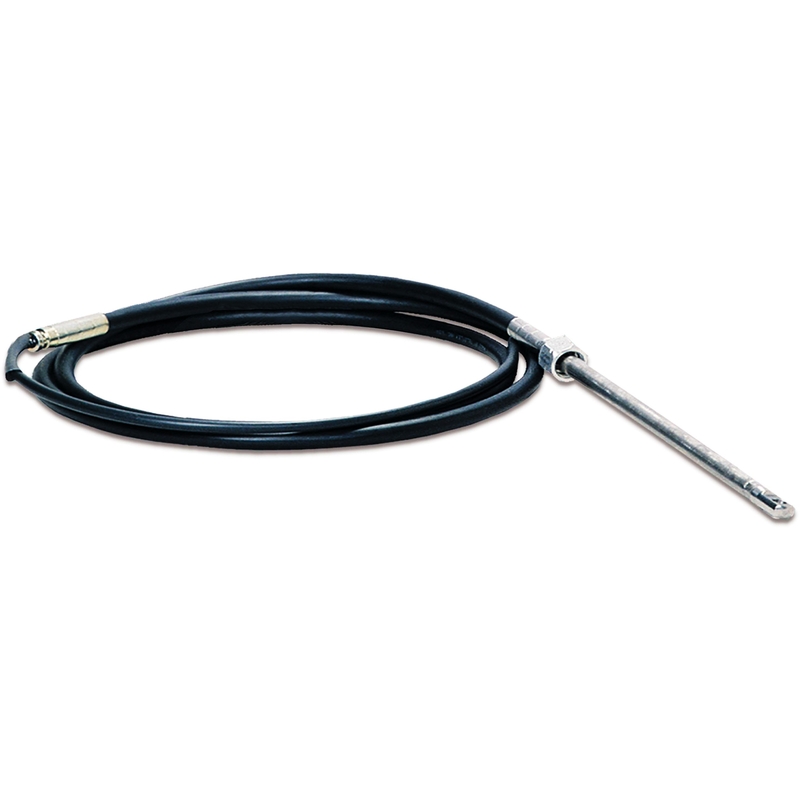 Closely inspect the cable jacket for cracks, tears, cuts or corrosion. The most likely places for damage to occur is at the crimped ends of the cable. Steering cables are NOT repairable; you should always replace a damaged steering cable. If a cable is very difficult to move, it definitely should be replaced as it can be a safety hazard. Removing a steering cable is fairly straightforward. You should disconnect the cable from the steering helm and from the engine using the proper wrench to loosen bolts that secure it. Before you pull the cable through the boat, tie a pull rope to the helm end of the cable (this will allow you to pull the new cable back through the boat without any trouble or frustration). The proper way to remove the cable is to pull it through the boat from the engine end. Be careful not to pull the cable too hard or fast; you could possibly damage or dislodge the wiring harness inside the boat or even damage the control box. All modern cable manufacturers print the cable part number right on the jacket of the cable. Simply obtain the cable number from the cable jacket, and you can call us or search for the number on our website. With most brands, like Seastar Solutions and Uflex, the length of the cable is included as the last two digits of the part number (e.g. SSC13412 represents a 12-foot cable). Using the part number is the most accurate way of determining the cable length you need; however, if you cannot obtain the part number, you will have to measure the cable yourself. Measuring a steering cable correctly depends on the type of steering cable you have. To measure a rotary steering cable, you should lay the cable out completely straight and measure ONLY the cable jacket in inches. Then, you should add another 18 inches to that length, and then round up to the next foot. To measure a rack & pinion steering cable, you should measure ONLY the cable jacket in inches. Then you should add another 30 inches to that length, and then round up to the next foot. For JBS jet boat cables, measure the entire cable from tip to tip; round up to the next foot to get a whole foot length. If you are unsure of which style steering system you have, please contact Marine Parts Source or an experienced mechanic for assistance. Once you have the new cable, simply tie the helm end to your pull rope (You DID use a pull rope when removing the old cable, right?). This time, you'll pull on the pull rope from the helm side of the boat until you have successfully pulled the new steering cable all the way to the helm. Once again, be careful not to pull too hard or fast to avoid damaging any other components. Once the cable is through, you can bolt it to the helm and to the engine. Before attaching the telescoping ram to the engine, make sure that the tube is completely clean. Grease it liberally with a high-quality, water-resistant marine grease. Make sure to grease both the outside tube and the inner telescoping ram. When you attach the cable to both the engine and the helm, make sure that all connections are tight. Test the boat's steering wheel to make sure there is no indication of tightness or binding, as well as any "sloppy" or excessive play in the steering. As always, if you are unsure about performing a repair yourself, please consult an experienced boat mechanic for assistance. And don't hesitate to call Marine Parts Source for questions or visit our website to get the right cable for your boat shipped to you today!